By 1912 Pierre Cartier had established himself among the elite of New York through the buying and selling of some of the world's most awe inspiring gems, including the 45.52 carat Hope Diamond. But Pierre was not satisfied with his New York salon. He wanted more for Cartier. He wanted a grander building that could both be a beacon for the city's elite and be on par with Rue de la Paix, the store's flagship in Paris. Then one day fate stepped in and offered Cartier an opportunity in the form of a 5th avenue mansion, a multimillionaire's wife and a double strand of pearls. The original owner of the 5th avenue mansion that this story revolves around was an American businessman named Morton F. Plant. Morton was the son of Henry Bradley Plant, who had built an enormous railroad and steamship network across the South that came to be known as the Plant System. He was not, however, well loved by his father. Even though Morton had been working as the president of his father's company Henry had, in a cold move, attempted to cut Morton completely out of his will and leave his fortune to his grandson. Morton and Henry's wife contested the will and eventually won back the fortune that Henry had attempted to deny them. Morton went on to capitalize on his father's existing business and continued to grow it further. In 1887 Morton married his first wife Nellie, but she died in 1913, at the age of 50. In 1914, ten months after his first wife's death 61 year old Morton married 31 year old Mae Caldwell Manwaring (or Maisie, as she was nicknamed). Maisie was married to a hotel owner named Selden Manwaring at the time she and Plant met and engaged in a whirlwind romance. Some stories surrounding the couple's courtship state that Morton Plant was so head over heels for Maisie that he paid Selden Manwaring $8 million for an uncontested divorce! After their marriage Morton moved Maisie into his 5th avenue mansion in New York City. The Morton Plant House was part of a group of mansions built on Fifth Avenue, known as "Millionaire's Row", that were home to the Vanderbilts, the Astors, and other notable wealthy New Yorkers; however, at the time that Maisie was moving in, homes like the Plant's opulent six story Italian Renaissance style home with limestone and marble accents (like the others of Millionaire's Row) were a dying breed. For a number of years commercial progress had been changing the face of the area. Hotels such as the Waldorf and the Astoria had led the change a number of years earlier, and now storefronts were moving in across from the stately homes. Pierre Cartier arrived in New York in 1909. The French jeweler's first residence in New York was 712 Fifth Avenue. He established the Cartier boutique in this area of New York City as a direct response to rival jeweler Dreicer, who was located at 560 Fifth Avenue. Dreicer was creating and selling knocking off Cartier designs because he could create them faster than authentic pieces could be imported from Paris so it was imperative to Pierre that he establish workshops in New York, with his own workforce. By cutting delivery time and through his highly publicized acquisition and sale of rare gems (such as the Hope Diamond) Pierre was able to further push Cartier into the spotlight and the business's profile continued to rise among the elite of New York. Meanwhile the Plants had begun construction on a new larger home on 86th and 5th avenue. By 1917 many of the families that had called Millionaire's Row home had left for new residences to the north and the businesses that had been seeking centralized locations continued their encroachment into the neighborhood. It was around this time that Maisie Plant fell head over heels for a natural pearl necklace in Pierre's New York City salon. The necklace was a double strand of natural South Sea pearls. The smaller strand consisted of 55 pearls and the larger, of 73. The 128 pearls that made up the necklace had taken years to assemble. Each one having been collected by hand by a diver. The pearls were then matched in color and size to create perfect graduated strands. Because of the rarity of natural pearls (cultured pearls had not yet reached the commercial markets) were a symbol of wealth and status among New York's social elite. Pierre sensed an opportunity and proposed a trade. "The Morton F. Plant dwelling at the southeast corner of Fifth avenue and 52nd street, has been sold to Louis J. Cartier, of Paris, and Pierre C. Cartier, of New York, jewelers, who several months ago leased the property for their business. Ownership was transferred last Saturday for $100 and other valuable considerations. The option to purchase was given to the tenants in their lease, and they have availed themselves of this opportunity. The dwelling is being altered for trade purposes and will soon be ready for occupancy by the firm, which is now located in upper Fifth avenue. The Plant dwelling is one of the best known on Fifth avenue; it is opposite to the Vanderbilt houses, and helps to serve as a barrier to the northward movement of trade on Fifth avenue. Mr. Plant was approached many times with offers to sell or lease his house, but would not consider any proposition until several months ago, when he decided that his stand against the trade was useless." According to the New York Times the necklace was valued at $1 million and the building was valued at $925,000. Morton passed away on November 4, 1918 (less than a year and a half after the mansion sale) leaving his wife Maisie his fortune. Maisie married twice more, before passing away at the age of 75 in July of 1957. The auction of her estate, was reported in Time magazine's "At The End Of An Avenue." "This week her Manhattan house, the last of the fabulous Fifth Avenue mansions to be fully occupied, will go on the block. Just to tabulate her possessions, the Manhattan auction house, Parke-Bernet, has published a 313-page illustrated catalogue. Sale of the 1021 listed items will take two weeks, and is expected to bring over $1,000,000, not counting the 167 lots of jewelry. Among the jewels are two of the most famous Oriental pearl necklaces ever assembled, a strand of 55 and another of 73 matched and graduated pearls, which in 1916 Mrs. Rovensky (then Mrs. Plant) received from her multimillionaire husband. Commodore Plant had taken them as payment of $1,000,000 for their house at 52nd Street and Fifth Avenue." The pearl strands sold for a paltry $181,000. Pearl sales had in fact dropped markedly not long after the Plants completed the trade. This was due to the introduction of cultured pearls by Kokichi Mikimoto. The Plant's palatial house on East 86th Street was torn down in 1960, and replaced by an apartment building. The only remnants of the home that remain are marble columns and a marble fountain. The Cartier Mansion's story has a somewhat happier ending. As part of the deal Pierre agreed that he would not alter the exterior of the building in any way. Interestingly even after the mansion's conversion to a commercial entity the interior was also mostly untouched until the renovation in the 2000's. The building has since undergone two refurbishments, one in 2000-2001 and another in 2016. The building currently has landmark status in New York City. As for the famous pearls, after the were sold at auction they were never seen again. Cartier pearl necklace, 2016, created to celebrate the re-opening of the 653 Fifth Avenue Mansion. The Empress Crown: part of the coronation regalia used by the only Empress of Iran, Farah Pahlavi. Mohammad Reza Pahlavi had already ruled Iran for two decades when he married Farah Dina in 1959, but he not yet had his official coronation. Mohammad Reza Pahlavi put off his coronation saying that he believed he could only be crowned when he truly felt he deserved it. That time came in 1967; the coronation would take place in October of that year and it was set to break with tradition. The Empress Farah's crown is white gold and green velvet covered with diamonds, pearls, emeralds, rubies, and spinels. 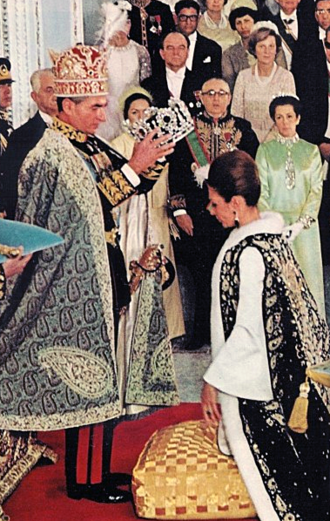 In a move reminiscent of Napoleon and Josephine, Emperor Mohammad Reza Pahlavi crowned his wife, Empress Farah, at their coronation in 1967. For centuries the wives of monarchs were not crowned; only the male ruler had that honor. This changed with Mohammad Reza Pahlavi. 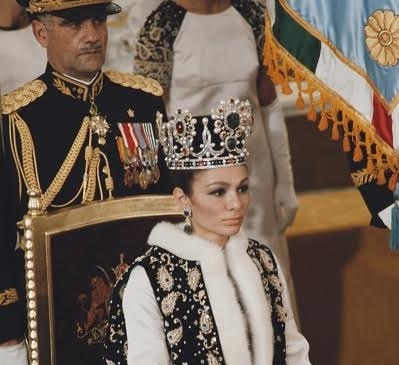 In a nod to the White Revolution's mandate on the emancipation of women, Emperor Pahlavi was determined to also have his consort crowned; however, there was a slight problem: since it had been centuries since an Iranian empress had been crowned, there was no appropriate crown available. The honorable task of making the new crown would fall to Van Cleef and Arpels. As was dictated by tradition, the gems used in the crown and coronation jewelry were selected from loose stones already in the Imperial treasury. None of the items that were part of the Imperial treasury were allowed to leave Iran so Van Cleef & Arpels had to send a team of jewelers to Tehran in order to construct the crown. While there, the team, Farah, and other important people in the Iranian government were consulted on the design aspects so that the finished product would be perfect. The crown ended up taking six months to complete. The crown itself is made from white gold and green velvet, covered with diamonds, pearls, emeralds, rubies, and spinels. By early 1978, the rising discontent in Iran had started to become more evident, eventually leading to demonstrations against the monarchy. The Empress recalled in her memoirs that "there was an increasingly palpable sense of unease". By the year's end riots and political unrest had reached a head and martial law was put into effect. The country was on the verge of open revolution. On January 16, 1979 both the Emperor and Empress decided to leave the country and begin a life in exile. Empress Farah would be the first and the last Empress to wear the magnificent crown. When the Iranian revolution occurred it was thought that the Iranian crown jewels might have been lost. Miraculously, most of the collection remained intact and the jewels were put on public display under the presidency of Hashemi Rafsanjani in the 1990s at the Central Bank in Tehran. To read more about the Empress and her life I suggest checking out her memoir An Enduring Love: My Life with the Shah: A Memoir . In 1861 president Lincoln purchased a demi-parure of seed pearl jewelry, from Tiffany &Co., for his wife and first lady Mary Todd Lincoln to wear to the President's inaugural ball. The complete parure (suite) of seed pearl jewelry would have consists of a collar necklace, a pair of bracelets, a pair of earrings, one or possibly two brooches, and a corsage brooch and cost around $1,000. President Lincoln, however opted to purchase a less expensive demi-parure consisting of a necklace and a pair of bracelets only, which cost $530. Seed pearls arranged in a rosette shape with a silver band. Both bracelets were identicle. Seed peals arranged in a rosette shape. The necklace is choker length. First Lady Mary Todd Lincoln wearing the Tiffany seed pearl jewelry demi-parure. Photograph taken at the Washington studio of Mathew Brady. During a time when the nation was standing on the precipice of war many of Lincoln's political adversaries criticized the money that was spent on the First Lady's jewelry and gown ( her gown cost an astounding $2,000). Princess Mary of Denmark looked stunning at the annual royal New Year’s Banquet held at Amalienborg Palace this year. She paired her gold dress with a diamond and ruby tiara and her Knight of the Order of the Elephant collar. The tiara began life in the court of Napoleon Bonaparte and looked very different from its current form. In honor of the grand coronation planned for the Emperor, Bonaparte had given money to many of his marshals so that jewels with the appropriate grandeur could be created/bought for their wives. Jean Baptiste Bernadotte was one of those marshals. He purchased the ruby and diamond wreath tiara and accompanying parure for his wife, Désirée Clary. Jean Baptiste Bernadotte and his wife Désirée Clary later became King Carl XIV Johan and Queen Desideria of Sweden, and thus the jewels found a new Swedish home. The tiara came to Denmark with Swedish princess Louise who married the future Danish king (Fredrick VIII) in 1869. Louise had received the tiara as a wedding gift from her grandmother, Queen Josephine of Sweden (Désirée's daughter-in-law). Queen Louise later gave the tiara to her son Crown Prince Christian's bride Alexandrine as a wedding gift; Alexandrine would inherit the rest of the parure on Louise's death. Alexandrine then gave it to Princess Ingrid of Sweden when she married Crown Prince Frederik of Denmark in 1935. In the hands of Queen Ingrid the original small wreath was transformed. 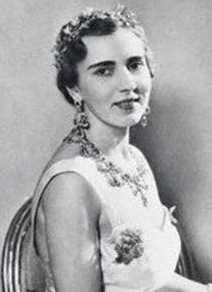 In 1947, Ingrid added two of the brooches that came with the original parure to the tiara. This gave the tiara a much more substantive look and turned the wreath into a proper tiara. When Queen Ingrid died in 2000 she left the parure to her grandson, Crown Prince Frederik who would go on to marry Princess Mary. The ruby tiara is the first tiara Princess Mary ever wore during her pre-wedding events in 2004. Mary also wears it for the annual New Years Court gala (mentioned above). The current parure consists of a necklace, hairpins, earrings, a brooch, a bracelet, and a ring (an addition care of Mary). Princess Mary does not have many grand pieces at her disposal, but with Mary's own inventiveness has and all that is available with the ruby parure Mary is able to make the ruby parure "stretch" so to speak. Mary has also followed in Ingrid's footsteps by altering the shape of the tiara to her own taste. It was not as major of a change as Ingrid's, though it is noticeable in a side by side comparison. Mary rearranged the diamond covered leaves creating a more condensed look which sits more upright. The work on the tiara and the rest of the set was done by the Marianne Dulong jewelry firm. They also created a new ring and hairpins from pieces that were left over. The new tiara debuted in 2010. The Imperial State Crown Featuring the "Black Prince Ruby"
The Black Prince's Ruby is one of the most famous members of the British Crown jewels, but despite its name, the stone is not a ruby. The Black Prince's Ruby is actually a deep red un-faceted spinel. The stone, which has been in the possession of the British Royal Family since 1367, was named after Edward of Woodstock, Prince of Wales. It is one of the oldest of gems included in the Royal Collection of Crown Jewels and currently sits in the cross at the front of the Imperial State Crown, just above the Lesser Star of Africa (Cullinan II). At an estimated weight of 170 carats and a length of almost 5 centimeters, the Black Prince's Ruby is the one of the world's largest uncut red spinel gemstones. The Black Prince's Ruby was polished into a bead-like shape which was drilled, strung and worn as a pendant and various other forms of jewelry prior to it being placed in the Imperial Crown. The drill hole has since been plugged with a smaller ruby. Why was this spinel misidentified as a ruby? As with many other gemstones 'rubies' were historically a category of gemstones that would have included all red transparent gemstones. It wasn't until 1783 that spinel was differentiated from ruby. Spinel and ruby (corundum) can be distinguished based on its chemical properties and physical characteristics. Where did the Black Prince Ruby come from? The Black Prince's Ruby was believed to have been mined in the 14th century somewhere from present-day Tajikistan, which was then known as Badakshan. The stone belonged to Prince Abu Sa'id of the Moorish Kingdom of Granada. During the mid 14th century the Moorish Kingdom of Granada was being attacked and placed once again under Castilian rule as a part of the Christian Reconquest of the Iberian peninsula. Abū Sa'īd's rule was confronted by that of Peter of Castile, also known as Don Pedro the Cruel. According to historical accounts, Abū Sa'īd wanted to surrender to Don Pedro. Don Pedro welcomed him to Seville. When Abū Sa'īd met with Don Pedro, Don Pedro had Abū Saī'd's servants killed and it is believed that he may have personally stabbed Sa'īd to death himself. It is said that when Don Pedro searched Sa'īd's corpse, the spinel was found and added to Don Pedro's possessions. In 1366, Don Pedro's illegitimate brother, Henry of Trastámara, revolted against Don Pedro. Don Pedro made an alliance with the Black Prince, the son of Edward III of England in an attempt to thwart the revolt. After the revolt was successfully put down the Black Prince demanded the ruby in exchange for his aid. It is thought that Don Pedro was reluctantly obligated to turn the stone over and the Black Prince took the Ruby back to England. The Ruby resurfaces again in 1415 when Henry V of England wore a gem-encrusted helmet that included the Black Prince's Ruby during his battle in France. In the Battle of Agincourt on October 25, 1415, the French Duke of Alençon struck Henry on the head with a battleaxe, and Henry nearly lost the helmet, along with his life. The battle was won by Henry's forces and the Black Prince's Ruby was saved. The gemstone was worn into battle once again by Richard III who wore the stone on his helmet at the Battle of Bosworth, where he died. The 1512 inventory of Henry VIII's posessions mentions "a great balas ruby" set in the Tudor Crown. This is believed to be the Black Prince Ruby. It remained there until the time of Oliver Cromwell in the 17th century, when (excepting of the Coronation Chair and several other items) Cromwell had the principal symbols of the king's power disassembled and sold, while the gold was melted down and made into coins. The fate of the Black Prince's Ruby, during that time in England is not clear, but it came back into the monarchy's posession in 1660 when Charles II and the monarchy was restored. In 1838 Queen Victoria was crowned with a new Imperial State Crown made by Rundell and Bridge. The crown contained 3,093 gems, including the spinel at the front. This crown was remade in 1937 into the current, lighter, crown and a small plaque was placed on the reverse of the gemstone that commemorates the crown's history. Jane’s is the Greek-style cross on the left. The Stuart Sapphire is a 104-carat blue sapphire that is a part of the British Crown Jewels. It is believed that the stone belonged to Charles II, and that it was most likely among the jewels that his successor, James II took with him when he fled to France in 1688. The stone was then passed to his son, James Stuart (the ‘Old Pretender’) who left it to his son, Henry Benedict, known later as Cardinal York, who wore it in his mitre (hat). Benedict eventually put the sapphire, and many other Stuart relics, up for sale. It was purchased by George III in 1807 and returned to the United Kingdom from present-day Italy. On the Imperial State Crown worn by Queen Victoria, the jewel was front and center below the Black Prince’s Ruby. In 1909, during the reign of Edward VII, the stone was moved to the back of the crown to make way for the 317-carat Cullinan II diamond. Today the sapphire still sits at the back of the crown used by Queen Elizabeth II. The gemstone is oval-shaped, about 3.8 cm long and 2.5 cm wide, and has one or two blemishes. At some point a hole was drilled at one end, probably so the stone could be worn as a pendant. On the back is a miniature plaque engraved with a short history of the crown. This romantic tiara is an heirloom with a long history. The tiara is originally German. It was made in the 19th century by Koch. It was a wedding gift from King Wilhelm of Prussia to his daughter, Princess Louise, for her marriage to Grand Duke Frederick of Baden in 1856. The tiara then migrated to Stockholm when Frederick and Louise's daughter, Victoria, married King Gustaf V of Sweden in 1881. On Victoria's death in 1930, her granddaughter, Princess Ingrid, inherited the tiara. When Ingrid married Frederik IX of Denmark five years later, the tiara moved with her to Denmark. When Queen Ingrid died in 2000, her vast jewel collection passed into the royal families of Denmark, Greece, and Sayn-Wittgenstein-Berleburg. Queen Margrethe was the lucky duck who inherited the lovely petite tiara. The tiara itself is sweet and romantic. It features hearts shaped palmette motifs with small diamond flowers with yellow-toned centers in-between the hearts. The romantic feel makes the tiara perfect for weddings. It's also smaller (and more comfortable) than most of the show stopping tiaras owned by the queen, so it makes frequent appearances. The tiara was made by Gabriel Lemonnier around 1853, and was commissioned by Napoleon III to celebrate his marriage to Eugénie de Montijo (1826-1920). It has an astounding 212 pearls and 1998 diamonds. The tiara that was created for Eugénie is part of a parure which included bracelets, a stomacher, and a six strand pearl necklace. The pearls and diamonds that were used to create the tiara belonged to the French state treasury in the form of jewelry that had belonged to Empress Marie Louise (1791-1847, second wife of Napoleon I) and the Duchess of Angoulême (1778-1851). Because of this the tiara actually belonged to the state, not Eugenie. The tiara and other state jewels were subsequently returned to the state when she was exiled from France after Napoleon III’s 1870 defeat. The tiara was part of the crown jewels until the Third Republic decided to sell the entire collection in 1887. The tiara was eventually purchased by Prince Albert I of Thurn and Taxis as a wedding gift to his bride Archduchess Margarethe Klementine of Austria in 1890. The tiara remained a part of the Thurn and Taxis family for the next century. In 1989 the tiara was given to Prince Johannes future wife Gloria who wore the tiara on her wedding day. Princess Gloria (the “Punk Princess”) was known for her unique fashion combining family jewels with wild outfits and hairstyles. In 1992 her husband, Prince Johannes, died leaving large amounts of debt. As a result Gloria sold a lot of the family’s jewelry collection. Empress Eugénie’s Pearl and Diamond Tiara was sold for 935,000 Deutsche Marks. The tiara did not however end up in another a personal collection. Instead it was bought by the Friends of the Louvre, who gifted it to the museum. It now resides in that Paris museum along with other recovered French jewels. It is believed that the French emperor Napoleon Bonaparte and his consort Joséphine gave the emerald parure (set) to their adopted daughter, Stéphanie de Beauharnais, on her arranged marriage to the heir of the Grand Duke of Baden in 1806 (the marriage was arranged to consolidate the Confederacy of the Rhine). Nitot & Fils were the principal jewelers to Napoleon and Joséphine and probably made this set as well. The large stones and the relatively simple design are typical of the neo-classical tastes of Napoleon’s. The necklace is comprised of faceted table-cut emeralds bordered by diamonds and briolette-cut emerald drops all set in gold and silver. The drops at the back of the necklace were added later in the 1820s. They can be detached and worn as earrings. The parure originally included a tiara, necklace, a pair of earrings and a pair of bracelets. The set came to be known as the “Grand Duchess Stephanie Emerald Parure”. Sadly, only the emerald necklace and the pair of earrings of the original parure survived up to this day. It is thought that the parure was broken up after World War II. 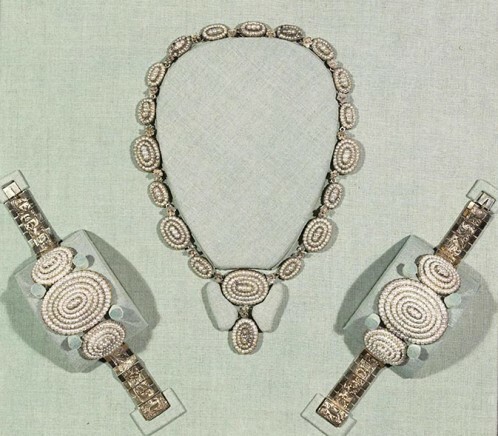 The necklace and the pair of earrings were acquired by Count Tagliavia. The necklace and earrings were later donated to the Victoria and Albert Museum in London by the widow of Count Tagliavia, Countess Margharita Tagliavia. The rectangular tablet dates back to 1695. It weighs 217.80 carats and is about 10 cm high. One side of the tablet is inscribed with Islamic prayers and the other is engraved with scrolling foliage and poppy flowers. The emerald was originally mined in Colombia. It was then sold in India. Emeralds were much desired by the rulers of the Mughal Empire of the time. The Mogul bears a date of 1107 A.H. (1695-1696 AD) which falls under the reign of Aurangzeb, the sixth emperor. The Mogul emerald is unique among its contemporaries in that the inscription is Shi'a however Mughal rulers were Sunni. The explanation is that it likely did not belong to not to Aurangzeb but that it belonged but to one of his courtiers or officers. It was sold on 27 September 2001 by Christie’s for £1,543,750, including buyer’s premium. As of 17 December 2008, it was in the possession of the Museum of Islamic Art, Doha, Qatar. April is almost over, but I feel like I would be remiss to let this diamond birthstone month pass without mentioning perhaps the most famous diamond ever discovered, the Cullinan diamond. The Cullinan diamond was discovered at a mine in the area that was known as the Transvaal in South Africa, in 1905. Weighing 3,106 carats (1.3lb), it was originally cast aside, believed to be too big for any use. The stone is named after the mine’s (then) chairman Thomas Cullinan. However a buyer for the massive stone was not be found. The stone was then purchased by the Transvaal government for £150,000 and was presented to King Edward VII on his 66th birthday. When the diamond was eventually transported to England it traveled by way of the ordinary parcel post while a decoy was sent on a heavily guarded ship. The Cullinan was cut into three large parts by Asscher Brothers of Amsterdam, and a number of smaller fragments. There is a story that the diamond cleaver Joseph Asscher promptly fainted after splitting the diamond in half, but this is likely just a myth intended to dramatize the stone's history. Ultimately the rough diamond was cut into nine major stones and ninety-six smaller ones. The two largest were incorporated into the Crown Jewels. This rectangular cushion-cut stone weighs 317.4 carats. It is set in the front cross of the Imperial State Crown, just below the Black Prince's Ruby (which is actually a large spinel). This is a heart-shaped diamond that weighs 18.8-carats. It is set into the centre of a platinum brooch. The brooch was originally part of a stomacher made for Queen Mary to wear at the Delhi Durbar in 1911. The mounting of the jewel was designed to be as adaptable as possible. It can be suspended from the VIII brooch and can be used to suspend the VII pendant. It was left all the brooches to Elizabeth II when she died in 1953. Left to Right: Cullinan V in the brooch setting, Queen Mary in the Dehli Dubar Parurue, Queen Elizabeth II wearing the Cullinan V brooch. Like the V the Cullinan VI-VIII were set with the Delhi Dubar in mind and are all subsequently part of what is called the Dehli Dubar Parure (see above photo). Cullinan VI is marquise-cut and weighs 8.8 carats. It unusually hangs from the brooch containing Cullinan VIII. Along with the V they formed part of the stomacher of the Delhi Durbar parure. Cullinan VII is also marquise-cut and weighs 11.5 carats. It was originally given by Edward VII to Queen Alexandra. After his death she gave the stone to Queen Mary, who had it set as a pendant hanging from the diamond and emerald Delhi Durbar Necklace, of the Delhi Durbar parure. Cullinan VIII is a cushion-cut diamond weighing 6.8 carats. It is set in the centre of a brooch forming part of the stomacher of the Delhi Durbar parure. As mentioned earlier it can be paired with Cullinan VI to form a brooch. Queen Elizabeth II is rarely seen wearing this brooch, however she has worn the Cullinan V many times. This was the last large diamond that was cut from the Cullinan. It is pear-cut and weighs 4.4 carats. It was mounted into an openwork 12-claw platinum ring setting for Queen Mary. Queen Elizabeth’s engagement ring might not be the grandest piece of jewelry in her arsenal, but it has a history. The diamonds in the ring are from a tiara that belonged to Prince Philip, Duke of Edinburgh’s mother Princess Alice of Battenberg (great granddaughter of Queen Victoria). Her wedding band is made of Welsh gold. In 1923, the Windsors were given a nugget of gold that was from the Clogau St. David’s mine in Bontddu Wales. The gold was used to make Elizabeth’s ring, as well as the wedding rings worn by Princess Margaret, Princess Anne, and Princess Diana. Later rings, including those worn by the Duchess of York, the Countess of Wessex, the Duchess of Cornwall, and the Duchess of Cambridge, have also been made from Welsh gold. Have you ever looked at tiaras and thought “well that’s nice, but it’s just not big enough!” Well then this is the tiara for you! The Luxembourg Empire Tiara dates from the 1800’s the tiara is covered in diamonds. The tiara is over 4 inches tall and contains numerous motifs, such as: geometric, anthemion, and scroll designs. The history of the tiara is a bit murky. Previous theories attempted to trace it back to Romanov Russia (with the look of the tiara it isn’t hard to imagine). However, the current thought is that the tiara was possibly acquired as a wedding gift for Pauline of Württemberg, who married Wilhelm, Duke of Nassau, in 1829. The German dukes of Nassau became the rulers of the grand duchy of Luxembourg in 1890, when law prevented Queen Wilhelmina of the Netherlands from ruling. We have visual evidence of the tiara’s public debut on the head of reigning Grand Duchess Charlotte when she married Prince Felix of Bourbon-Parma in 1919. One of Charlotte’s sisters (Hilda), wore it for her wedding too. On her abdication Charlotte passed the grand tiara to her daughter-in-law Joséphine-Charlotte, the new grand duchess. Joséphine-Charlotte’s husband abdicated in favor of his son Henri in 2001, however her daughter-in-law Maria Teresa did not wear it publicly until after Joséphine-Charlotte’s death. Grand Duchess Maria Teresa has worn the tiara on many state occasions and to weddings (notably Crown Princess Victoria’s wedding in 2010). The olive wreath tiara was commissioned from Cartier by Princess Marie Bonaparte on the occasion of her marriage to Prince George of Greece and Denmark in 1907. Marie was both a princess and an heiress. She was descended from French royalty by way of Lucien Bonapart (a younger brother of Napoleon) as well as being the granddaughter of François Blanc (a real estate developer whose casino projects included the famous Monte Carlo Casino in Monaco). Prince George of Greece and Denmark was one of the sons of King George I of the Hellenes. The tiara, designed by Cartier, was a nod to Marie’s imperial heritage. Diamond olive leaves with eleven diamond “olives", which could be swapped out for other stones at will. Apparently the original “olives” were emeralds which Marie switched out in favor of rubies occasionally. In the center of the already magnificent tiara was a jaw dropping enormous pear-shaped diamond set en tremblant. Princess Marie died in 1962. Approximately thirty years later the tiara went up for auction without the central diamond or the emerald and ruby stones. The tiara was purchased in 1999 by the Albion Art Institute and the central diamond was replaced. The marriage between Marie and George was…complicated (for lack of a better term). Suffice to say as a result of her marriage she became a devout follower of Sigmund Freud. I won’t go into the sordid details here but, if you’re curious take a minute to google them. A large pink diamond is believed to have decorated the throne of Mughal emperor Shah Jahan. The original large stone was described by French jeweler Jean-Baptiste Tavernier in 1642. He called it the Great Table diamond. The theory is that the large diamond was cut into two pieces with the larger part being the Darya-i Noor and the smaller part being the 60-carat Noor-ul-Ain. Both are part of the Iranian Imperial collection. The top stone in the above image is a replica of the Great Table. It is believed that it measured 56.3 x 29.5 x 12.15 mm. Below the Great Table are replicas of the stones that are believed to have been cut from it. On the left is the Noor-ul-Ain (60 carats oval shaped). On the right is the previously mentioned Darya-i Noor (182 carats rectangular shaped/table cut). The pale-pink colored diamond, weighs 182 carats and is part of the Iranian crown jewels. The name, “Darya-i Noor” is Persian and means “The Sea of Light”. The 60 carat pale pink diamond’s name means “the light of the eye”. The diamond resides in the Iranian tiara of the same name. The tiara was made for Iranian Empress Farah Pahlavi’s wedding to Shah Mohammad Reza Pahlavi in 1958. The tiara was designed by Harry Winston and features 324 pink, yellow, and white diamonds set in platinum. The language of flowers is a way of communicating through the use or arrangement of flowers. It has been used for thousands of years by various cultures. Interest in this way of communicating reached its peak in Victorian England and in the United States during the 19th century. Flowers and plants were used to send covert messages. One of the first gifts Prince Albert sent his fiancée Queen Victoria was a gold and porcelain orange blossom brooch, a flower traditionally associated with chastity and betrothal. At their wedding the Queen wore sprays of real orange blossom in her hair and on her bodice. Prince Albert continued to give the Queen orange blossom jewelry, another brooch and matching earrings in December 1845 and a headdress in February 1846 (on their anniversary), eventually creating this beautiful set, parts of which she always wore on their wedding anniversary. The headdress incorporates four small green enamel oranges, intended to represent the four eldest children - Victoria, Albert Edward, Alice and Alfred. The Queen wrote in her journal, ‘it is such a lovely wreath & such a dear kind thought of Albert’s’ (10 February 1846). The brooches were two of a group of jewels placed in the ‘Albert Room’ at Windsor Castle after the Queen’s death in 1901 (the room where Prince Albert had died in 1861). The Queen left instructions for a specific list of personal jewellery to be placed there and not passed on in the family. The Williamson Diamond brooch. The Williamson Diamond discovered in October 1947 at the Mwadui mine in Tanganyika, owned by the Canadian geologist and royalist Dr John Thoburn Williamson, for whom the diamond was named. The 54.5 carat uncut stone, was presented by Dr Williamson, as a wedding present to the (then) Princess Elizabeth in 1947. The firm of Briefel and Lemer of Clerkenwell were entrusted with cutting the diamond and subsequently turned the rough into a 23.6-carat round brilliant, a cut that was chosen to show off its rose color. Queen Mary and Princess Elizabeth made a point of visiting the Clerkenwell based firm and inspected the work of cutting and polishing of the stone on 10 March 1948. The pink stone was set as the center of a brooch in the form of a jonquil flower (narcissus), designed by Frederick Mew of Cartier, in 1953. Dr Williamson also gifted 170 small brilliant-cut diamonds, 12 baguette-cut diamonds and 21 marquise diamonds, which were used to form the petals, stalk and the leaves of this brooch. Berlin iron's roots start with the establishment of the Königliche Eisengiesserei bei Berlin or Royal Berlin Foundry in 1804. The Royal Berlin Foundry initially began with the production of iron goods such as vases, knife stands, candelabra, bowls, plaques and medallions, as well as more commercial articles such as fences, bridges and garden furniture. The first jewelry items were produced in 1806 and consisted of mostly long chains with cast links. Later, more elaborate necklaces with medallions joined with links and wire work mesh were manufactured. Iron jewelry reached its peak in both production and artistic expression between 1813 and 1815 when war fanned the flames of the iron forges. To aid in the uprising against Napoleon during the War of Liberation the Prussian royal family urged all citizens to contribute their gold and silver jewelry. In return the people were given iron jewelry often with the inscription Gold gab ich für Eisen (I gave gold for iron), or Für das Wohl des Vaterlands (For the welfare of our country / fatherland) or with a portrait of Frederick William III of Prussia on the back. The numbers of pieces produced started declining after 1850, but still continued to be manufactured until the end of the century. Towards it's decline there appears to have also been a shift in design favoring a more Gothic style. An attempt to emulate the previous Prussian example was made be the Austro-Hungarian's and German's during the 1900's (First World War). This was done again by exchanging gold jewelry for an iron, much of which was inscribed with some variation of the words: Gold gab ich zur Wehr, Eisen nahm ich zur Ehr (I give gold towards our defence effort and I take iron for honor). This attempt, however, was not as successful. Today Berlin Iron Jewelry pieces are considered collector's items. Because iron is a very brittle material and also susceptible to rust, comparatively few examples have survived. The best and most authentic pieces are usually found in museums or private collections. Replicas are widely manufactured today and buyers should be well informed before purchasing. Today is Luciadgen day (St. Lucy's Day). The girl chosen to represent St. Lucy wears a crown of candles so I thought that the Pearl Poiré Tiara from Denmark would be an appropriate piece to feature today. The tiara is thought to have been made around 1825 in Berlin at the request of King Friedrich Wilhelm III of Prussia. The tiara was a wedding gift for his daughter Louise, who was marrying Prince Frederik of the Netherlands. The tiara features 18 drop pearls (poiré pearls) dangling from tall diamond arches. The Prussian king also commissioned a look-alike tiara for his son Prince Albrecht's bride, Princess Marianne of the Netherlands; however, the second tiara's current whereabouts are unknown. The current version of the (now) Danish tiara wandered through various Scandinavian royal owners before it found its home in Denmark. The original owner, Princess Louise (1808-1870), left the tiara to her oldest daughter, also named Louise, who was Queen of Sweden and Norway. Queen Louise (1828-1871) died shortly after inheriting the tiara and it then passed to her daughter, who was also named Louise (1851-1926). This Louise married the future King Frederik VIII of Denmark in 1869, and the tiara arrived at its final home. That is a lot of Louise's, I know! Queen Louise of Denmark wore the tiara with a few other pearl and diamond pieces consisting of a demi-parure of a necklace and earrings (a wedding present from the Khedive of Egypt), and a brooch that came from her grandmother. The assembled parure (set) is still worn together today. Louise made sure that the parure stayed in Denmark by leaving it to the Danish Royal Property Trust. This means the pieces are not the personal property of any particular royal, so they will pass from monarch to monarch without being sold. And so the parure has been worn by Louise's daughter-in-law Queen Alexandrine (1879-1952); Alexandrine's daughter-in-law Queen Ingrid (1910-2000); and Ingrid's daughter Queen Margrethe, who wears them today. This tiara is frequently worn at the annual New Year's Court gala by Queen Margrethe. The tiara has also worn it to big events like her jubilee celebrations and Crown Princess Victoria's wedding. It also features prominently in many well-known portraits. The tiara is very rarely loaned as this is one of the pieces that has historically been kept for the queen. The exception was made for on the occasion of two British coronations: Ingrid, while still Crown Princess, at the 1937 coronation of George VI and Elizabeth, and Princess Margarethe at the 1953 coronation of Elizabeth II). Luciadagen, or Saint Lucy's Day, is also called the Feast of Saint Lucy. It is a Christian feast day celebrated on December 13, in Advent and commemorates the martyr Saint Lucy who (according to legend) brought "food and aid to Christians hiding in the catacombs" using a candle-lit wreath to light her way while leaving her hands free to carry food. Her feast once coincided with the Winter Solstice, the shortest day of the year before calendar reforms, so her feast day has become a festival of light. St. Lucy's Day is also viewed as an event signaling the arrival of Christmastide. St. Lucy’s Day is celebrated most commonly in Scandinavia, with their long dark winters. It is also popular in Italy, where it emphasizes a different aspect of the story. In Sweden, Denmark, Norway, and Finland, Lucia is venerated on December 13 in a ceremony where a girl is elected to portray Lucia. Wearing a white gown with a red sash and a crown of candles on her head, she walks at the head of a procession of women, each holding a candle. The candles symbolize the fire that refused to take St. Lucy's life when she was sentenced to be burned. The women sing a Lucia song while entering the room, to the melody of the traditional Neapolitan song Santa Lucia; the Italian lyrics describe the view from Santa Lucia in Naples, the various Scandinavian lyrics are fashioned for the occasion, describing the light with which Lucia overcomes the darkness. Each Scandinavian country has lyrics in their native tongues. In both Norway and Sweden, girls dressed as Lucy carry rolls and cookies in procession as songs are sung. Even boys take part in the procession as well, playing different roles associated with Christmas. After finishing this song, the procession sings Christmas carols or more songs about Lucia. In Denmark, the Day of Lucy (Luciadag) was first celebrated on December 13, 1944. The tradition was directly imported from Sweden by initiative of Franz Wend, secretary of Föreningen Norden, as an attempt "to bring light in a time of darkness”. During the German occupation of Scandinavian countries during the Second World War it was widely regarded as a means of passive protest. Today schools and kindergartens also use the occasion to mark the event as a special day for children on one of the final days before the Christmas holidays. There are also a number of additional historical traditions connected with the celebration, which are not widely observed. The night before candles are lit and all electrical lights are turned off, and on the Sunday closest to December 13 participants traditionally attend church. Svart senker natten seg i stall og stuer. Solen har gått sin vei, skyggene truer. i alle tyste rom som vinger bruser. Black night is falling in stables and homes. The Sun has gone away, the shadows are threatening. in all quiet rooms, like the waving of wings.